What vegetable is low in calories, high in fiber, a rich source of vitamins, minerals, and antioxidants—and tastes delicious? Asparagus, of course. And, since yesterday was April Fools Day—no fooling! Thomas Jefferson had asparagus beds at Monticello and often ate it marinated in oil, red wine vinegar, capers, and herbs. One of the most popular varieties is Mary Washington—named after George Washington’s mother. Washington grew asparagus at Mt. Vernon. Asparagus gets its name from the Greek word for sprout. There is a museum in Bavaria, Germany devoted entirely to asparagus. White asparagus is not a separate species. 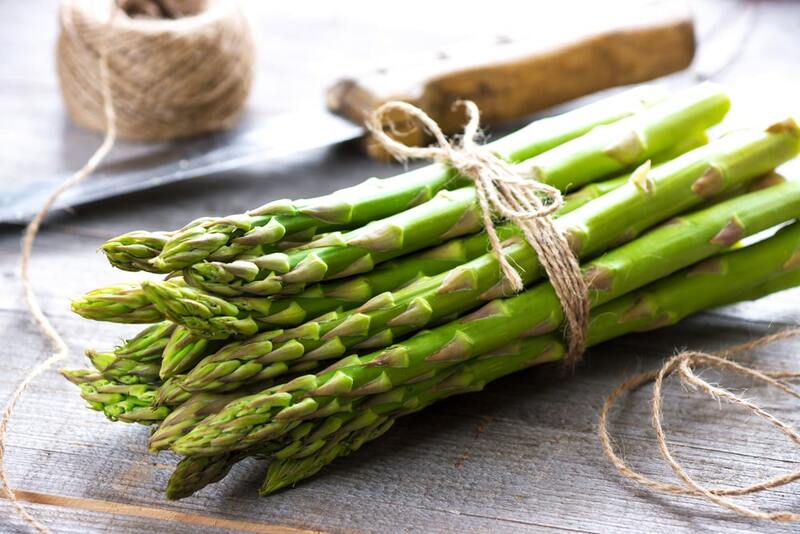 It is regular green asparagus that has been “blanched” (grown with the stems covered up) to keep them from sunlight. It’s the only way they eat it in Germany. In Michigan, they have an asparagus festival every spring, complete with an Asparagus Queen. Most of the world’s commercially grown asparagus is grown in Peru. It is very rich in nutrients, being a great source of vitamins K, E, Folic Acid, B1, B2, C, selenium, and folates. It’s high in anthocyanins—an important antioxidant. It’s also a good source of glutathione—which helps to break down free radicals. It only has 32 calories in a whole cup and is a great source of dietary fiber. Because it does not have an outer coating like many vegetables, asparagus begins to decline in quality shortly after being picked. You can keep it best by keeping the cut stems in an inch or so of water. But fresh is always better. What could be fresher than growing your own? Asparagus plants are available now and very easy to grow. To grow your own, choose a sunny well-draining spot. Remember that it is perennial and will come back for many years to give it a spot where it can grow undisturbed. Amend your soil with a mixture of regular compost and composted cow manure. Because asparagus prefers soil with a neutral pH, test your soil and amend, if necessary. Loosen the soil to a depth of about 12 inches and plant crowns two inches below the soil surface. Space plants two feet apart. Asparagus does not like to compete for water and nutrients so mulch well and keep weeded. Do not harvest spears the first season after planting, to allow roots to get well-established. The second spring harvest no more than two to three spears per plant. The third year, you can harvest for a period of four to six weeks, or until the new spears being produced are no bigger around than a pencil. I preheat the oven to 400 degrees, drizzle the asparagus with olive oil and sprinkle with the lemon-pepper and garlic salt. I roast them in the oven for about 15 minutes or until tender. Yes, I could use fresh-squeezed lemon and fresh ground pepper, but I don’t always have a lemon hanging around. This way, I don’t have to…. We have fresh asparagus crowns so come in while the selection is good.